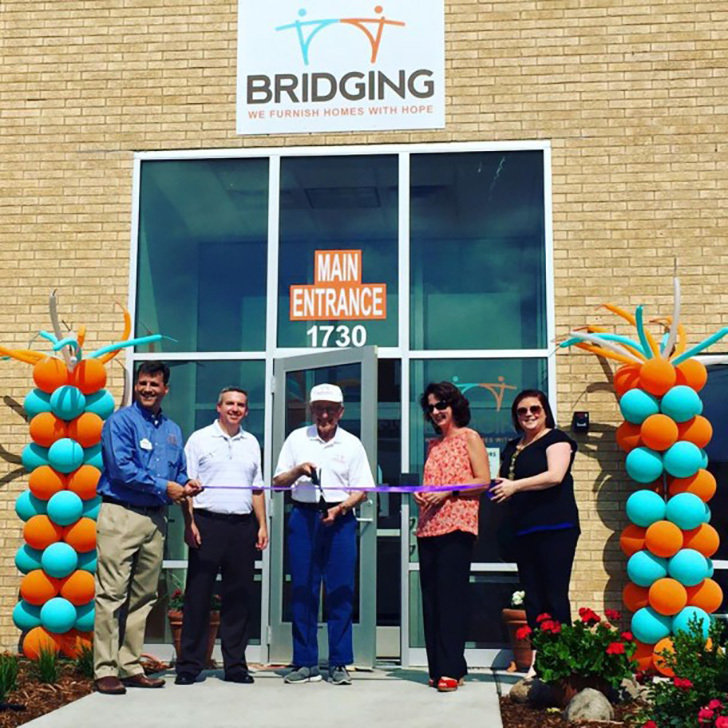 Founded by Fran Heitzman (pictured above cutting the ribbon), Bridging is a Twin-cities based nonprofit organization that improves lives by providing furniture and household goods to those transitioning out of homelessness and poverty. It has become the largest furniture bank in the United States and Canada and has furnished over 75,000 homes since 1987. Driven by volunteers and donations of furniture from the community, it truly bridges the gap between those who have and those who have not. Take a look at our involvement! 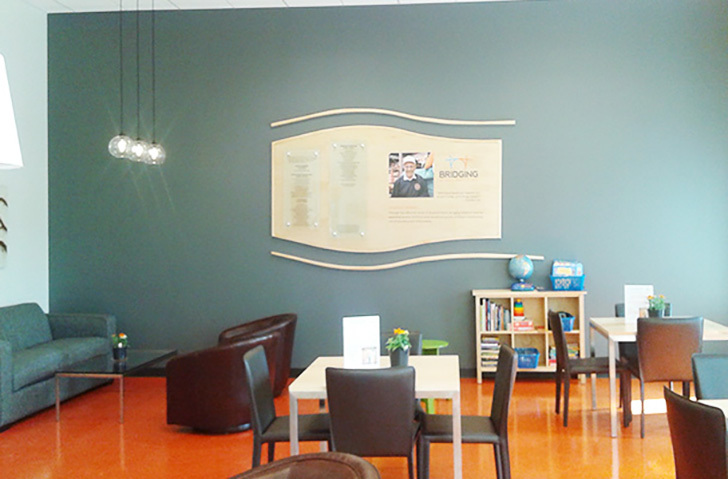 Since 2009, Room & Board has partnered with Bridging by donating furniture that we can no longer sell. In addition, our Delivery Associates collect unwanted furniture from our customers when dropping off their new pieces to donate to the program. Bridging recently purchased a new building in Roseville, Minnesota, and we had the opportunity to be a part of the design. Our Business Interiors team helped Bridging plan three main spaces: the entryway, lobby and a multi-functional break area-conference room. 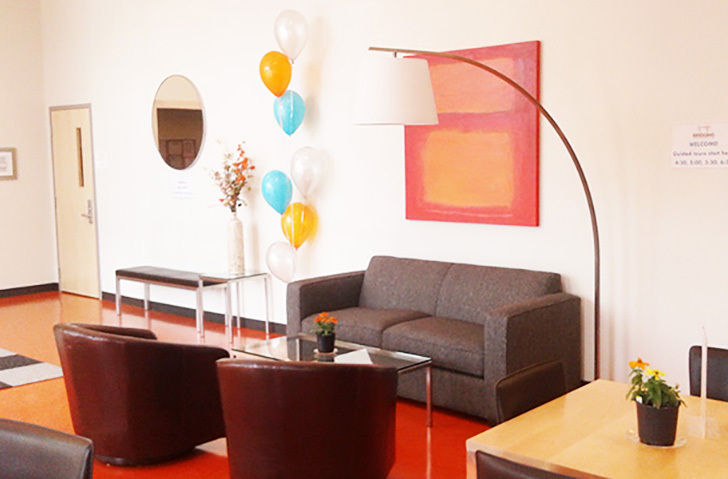 We donated furniture for these spaces as well as paint to create a seamless palette throughout. The welcoming entryway features a Portica bench and Portica end table underneath an Infinity round mirror. There is also a small seating area complete with two Amos swivel chairs, an Ian sofa, a Portica coffee table, a Streeter floor lamp. The lobby area creates several gathering spots with Portica square tables and Hirsch dining chairs. There is also a lounge area on the left with two more Amos swivel chairs, an Ian sofa, a Portica coffee table, and a set of Sky pendants . 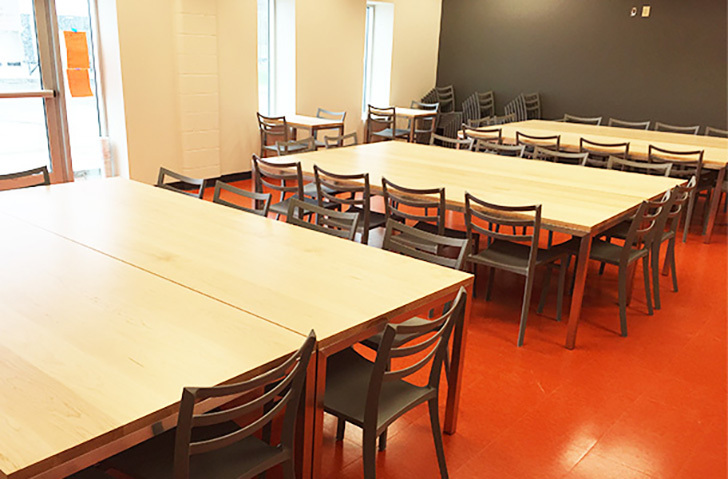 Portica tables and Sabrina chairs create a stylish and functional break room that doubles as the Bridging conference room for meetings, events and other large gatherings. Need help designing your home or business? Contact a Design Associate in-store, over the phone or online for help designing your dream space.